pseudobunny & co.: It has been a long time. I have not be so turned on by art lately. Combo effect of motherhood,lack of space, school,blah blah blah. Surprise is the best when you don't expect it. I picked that one cause I love me some good Dixon Ticonderoga. Wow that is amazing work! 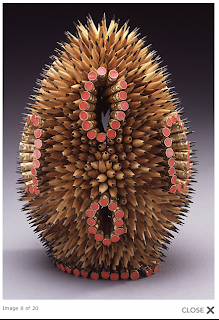 You never think of Pencil ends as something beautiful until a genius art brain puts them together. I remember when I was at WSU an art student made this amazing sculpture out of paper coffee cups and lids.